No matter the method, whether mass calling or mass texting, the purposes to do so are plenty. Mass calling and texting aren’t just effective messaging tools that businesses, non-profit institutions, and community organizations alike can take advantage of. Its usefulness has made it a popular tool of communication in recent years for entities of all kinds, including emergency services, private social groups, healthcare offices, schools, and employee pools. Mass messaging is particularly popular with school districts who are forced to work very hard to get imperative information out to the community of parents and students. The ability to send automated telephone calls or text messages with important updates about a variety of situations that range from school closures and delays to district wide meeting dates, allows district employees to spend less time getting the word out and more time on other school business. But, when it comes to deciding which medium to use — automated calling or mass texting — to get the message across, choosing one over the other may be highly dependent on two factors. First there is the audience to consider, then the needs of the organization doing the broadcasting. First, consider the common age of your audience. Younger generations have grown up with cell phones. They are more likely accustomed to conducting most of their online activity over their smartphones. Younger generation smartphone users use their devices to check email, send and receive texts, bank online, post to social media, watch videos, listen to music, and game, just to name a few. Reaching them via text seems like the easiest way to touch base with this particular audience. What younger generations of recipients don’t do as much of is use their phones for actual phone calls. And when they do, often those conversations are shorter compared to older phone users. What used to be communicated over the phone is now reserved for text messaging and email communication. It’s not uncommon to find people texting each other when they’re both found in the same room, even. If your organization or business’s clientele or audience base is composed largely of younger generation smartphone users, mass texting may be the preferred mass messaging of choice. Colleges, for example, may find great benefit in texting important information to their students as opposed to trying to send them a robocall. Sure, sending mass calls will work too, but the payoff with mass texting may be higher among this particular recipient pool. A college student may not be likely to answer their smartphone from a number they don’t recognize. And, if they do choose to listen to the voicemail left behind by an automated call, it may not be in a timely matter. Sending a mass text will almost guarantee students receive and read the important information your organization is trying to convey almost instantaneously. There may be situations, however, where the opposite is true — where phone calls are much more effective than mass texts. Take, for instance, the healthcare community. As people 65 years of age or older are more than twice as likely to find themselves in need of healthcare, communication regarding their medical needs may best be served in form of a telephone call. Although, there a plenty of smartphone savvy seniors today texting friends and loved ones on a regular basis, the majority of senior citizens may find a familiar phone call the most comfortable way to receive important information from their health care providers. Doctor’s offices may be tempted to move to a strictly text-based format to remind patients of important information such as facility changes or operating hour modifications, for example. But those offices, especially ones that specialize in geriatrics and geriatric related fields may find that automated phone calls have the best return on investment. While many senior citizens will have no problem at all receiving the information via text, there may be others who, because they did not grow up with smartphones, have difficulty becoming accustomed to communicating via text. They may even ignore text messages, and give their attention instead to a ringing phone. Other factors to take into consideration when deciding whether to launch your mass messaging campaign via voice or text, is the content and length of your message. If you are sending out specific date and time information, changes in dates and times, or lengthy messages full of details to remember, you may want to send it in form of a text message. Having the information already written down in a text message that the recipient can copy and paste or forward to other concerned parties is extremely convenient, especially with those who have busy lifestyles. However, if your message contains sensitive data such as company proprietary information that shouldn’t be seen by anyone who can read a lock screen, then voice communication is the best way to go. There’s no need taking a risk compromising sensitive data just for the other conveniences of mass texting. Text is the best way to go when urgency matters. Emergency notifications or messages that require an immediate response have a higher chance of being read and replied too when delivered as a text message. For purposes like these, the instantaneous nature of text messaging will help ensure that loyal customers become aware of the opportunity immediately. (Please note that Call-Em-All can not be used for marketing or promotional purposes. See our Responsible Use Policy.) A voicemail may be more likely to be pushed to the side if the recipient doesn’t recognize the originating number. While mass messaging via text or phone can be highly effective ways to get important information out to a large audience or client pool, choosing which method is best is highly dependent on the needs and comfort level of your clientele. 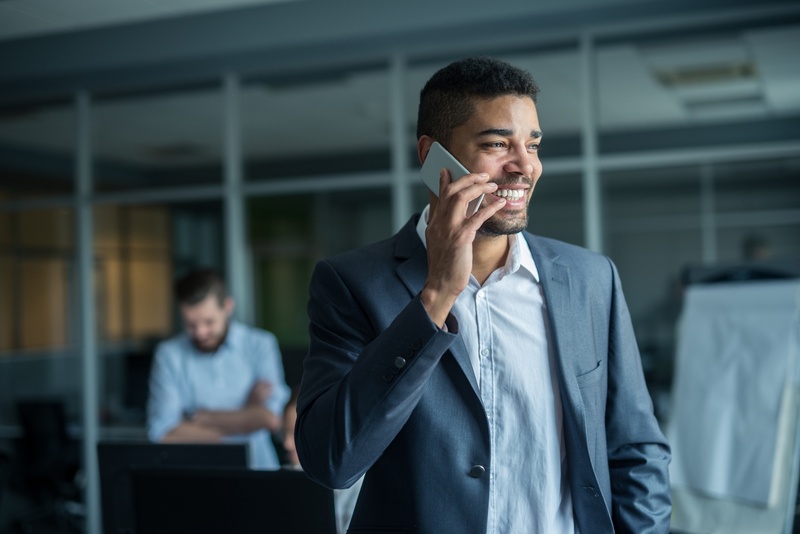 While phone calls may be best for people who aren’t used to using a phone for anything more than talking on it, it may not be so great for those people who conduct almost all of their business solely on their smartphones. Knowing your audience is key to knowing which medium to use.